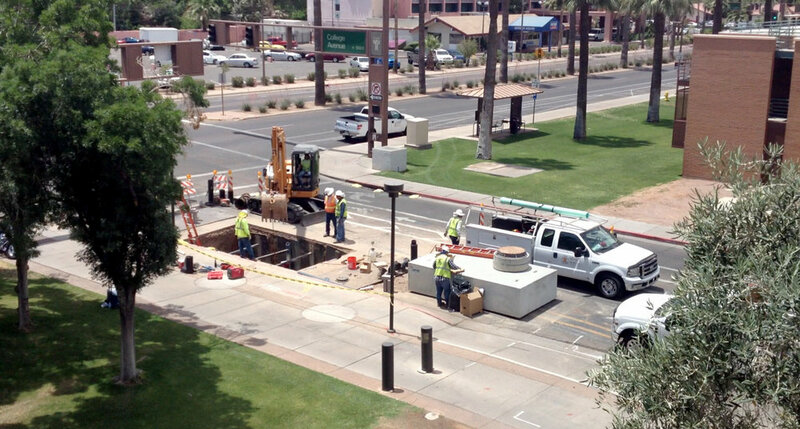 This project served to master-meter water flow to the ASU Main Campus. There were seventeen (17) water meter sites which are located around the perimeter where the water services enter the campus on University Drive, Rural Road, Apache Blvd., and Mill Ave. The project included the construction of the water meters, vaults, backflow prevention devices, and new piping configurations where necessary. In addition, the project scope included construction of a new 16-inch water main in Rural Road from Apache Boulevard to University Drive. This also included abandonment of an existing water line, new fire hydrants, gate valves, fire sprinkler connections, meters, service lines, connections to the water distribution system and other miscellaneous installations which were required as part of this project. The construction zones were located along the following four major arterial roadways: University Drive to the north, Rural Road to the east, Apache Boulevard to the south, and Mill Avenue to the west. Coordination with Valley Metro Light Rail, Valley Metro Bus, ASU campus schedules/activities, area events, and the City of Tempe were required to determine final scheduling of construction activities.